Subaru releases details on the new 2014 Impreza and the all-wheel-drive car provides new upgrades and much more than what's expected in a compact car. Subaru Canada has just released information on the new Impreza and it gets some new convenience and technology upgrades for 2014. It also comes with fuel economy compared to two-wheel drive compacts, but with the benefits of Subaru’s Symmetrical full-time All-Wheel drive. Subaru is a brand that is growing quickly around the globe as new buyers are attracted to the brand for reasons that the new Impreza provides. It’s fun to drive and offers buyers a feeling of confidence with the all-wheel-drive. And who wouldn’t want that kind of all-weather security along with great fuel mileage? Subaru has announced the new Impreza will get better mileage than the outgoing model. The 2014 Impreza with CVT will offer outstanding fuel efficiency with ratings of 7.5 L/100 km (31.3 mpg) city and 5.5 L/100 km (42.7 mpg) highway. That is fuel-mileage comparable to two-wheel-drive vehicles. It’s no wonder Subaru can’t keep up with the demand for their cars like the Impreza and new Forester SUV. The 2014 Impreza is powered by the same 2.0-liter Boxer engine and comes with a choice of a five-speed manual transmission or the second-generation Lineartronic Continuously Variable Transmission (CVT). It comes in four-door sedan and five-door hatchback models. Bluetooth mobile phone connectivity now comes standard on all models, which is what new Millennial buyers are looking for. It allows them to stay connected and at the same time allows the driver to keep their hands on the wheel and eyes on the road. All models also gain a MediaHub with Bluetooth streaming audio, allowing quick and easy connection to an iPod or USB. Buyers can choose more technology with the Limited Package that offers a voice-activated in-dash GPS navigation system with back-up camera. This feature is part of an audio system that includes XM Satellite Radio and XM NavTraffic (subscription required) as well as Bluetooth mobile phone connectivity with voice activation. The 2014 Impreza also gets gains in passenger and cargo room. A newly-designed scalloped-style front seat backrest design offers rear-seat passengers more comfort and legroom. The new model gets new upgrades to the instrument panel and 3-spoke steering wheel with integrated controls. All models feature an information display or a 4.3-inch color multi-function display (on Sport and Limited models) with trip computer, located in the center of the dashboard. Subaru knows the importance of having plenty of carrying space for a new generation of technology driven buyers. The Impreza features numerous compartments in the center console area to hold personal items such as phones, USB drives and MP3 players. And for those who listen to music on CDs, the console compartments provide ample storage for jewel cases. Performance enthusiasts can choose the new sporty 2014 Impreza WRX and the high-performance Impreza WRX STI. The Japanese automaker released a dynamic online brochure that fans can check out that offers 24 pages with cool interactive tools where fans can zoom in, bookmark pages or print all or select pages and share online. The new 2014 Subaru Impreza gives global Millennial buyers a great compact car that gets excellent fuel mileage, all-wheel-drive security, performance models and the technology to stay connected. 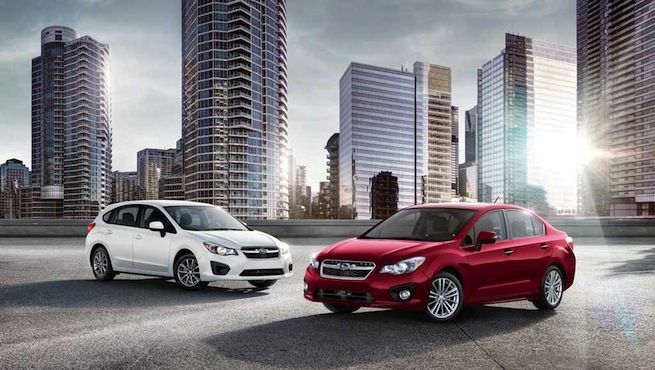 The Impreza offers much more than what’s expected in a compact car. Stay tuned to Torque News for more 2014 Impreza information on pricing and release dates when it’s announced.